Norristown High Speed Line: Service has been suspended due to weather conditions. 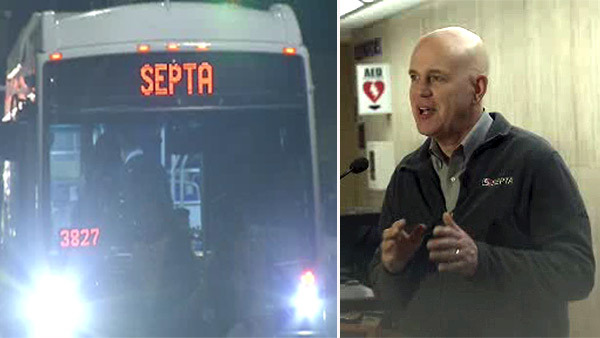 Trolley: Service on SEPTA's Routes 101 and 102 Trolleys has been suspended due to weather conditions. Bus: Routes H, XH, J, K, L, 22, 35, 38, 40, 44, 55, 61, 62, 65, 90, 92, 93, 95, 97, 112, 120, 126, 129, 131, 133, 204, 205, 206, 310 and 311 are suspended due to weather conditions. Forty-seven routes are on weather-related detours. Detours are available in the System Status section of septa.org. Regional Rail: Service, which is operating on a Saturday schedule, is experiencing delays of up to 30 minutes. The Cynwyd Line is not operating. For schedules, visit septa.org. Market-Frankford and Broad Street Lines are operating on or close to schedule.